Frugal moms everywhere know that getting the most bang for your buck when it comes to groceries is important so its always great when leftover ingredients can be made into something new. Its even better when that new recipe becomes a favorite for the whole family. 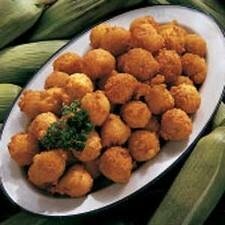 Hush puppies, the fried dough balls popular at seafood restaurants, are one of those recipes. Theyre made out of cornmeal, milk, water, and chopped onions, and then fried in lard previously used for a fish fry. So why are they called hush puppies? The reasons behind this vary, but from what Ive heard, the name comes from old southern hunters who would go out into the woods for the weekend with their dogs and then enjoy cooking up their catch over a fire. To quiet the barking dogs, the hunters would fry up a little cornmeal in the leftover fat in the pans and then toss it to the dogs to hush them up. Another theory is that the name originated from the frying of salamanders. However the delicious fried morsels got their name, the most important thing is that they are so tasty and easy to make. Mix everything together until the mixture is wet. Then refrigerate for 30 minutes to 5 hours. After removing the mixture from the refrigerator, heat oil to 350-375 degrees. Run a spoon under cold water and then take a spoonful of the hush puppy mixture and dip it into the hot oil until it releases from the spoon. Do this until there are six or seven hush puppies in the oil. Its important not to overload the pan with hush puppies because it will cool the oil and not cook properly. The outside of the hush puppies should be golden and the inside should be cooked inside. Make sure to tip your hush puppies over if they dont automatically roll over in the hot oil. This will make sure they are cooked evenly. Adjust the heat of the oil as needed. Allow the hush puppies to cool slightly before eating them.